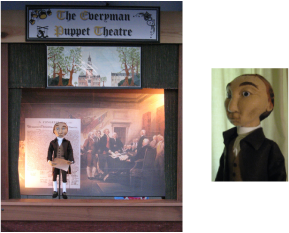 2012 was the inaugural year of The Everyman Puppet Theatre. 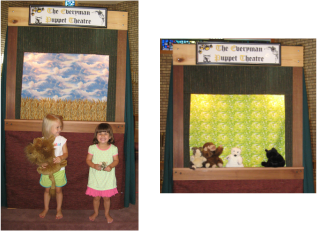 Besides performances, I am offering workshops on puppets and puppet theatre for adults and children in and around Picayune, MS. 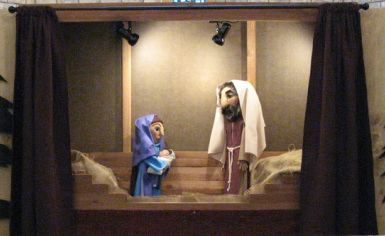 I studied puppetry at the University of Washington in 1984-1985 under world-renowned puppeteer Aurora Valentinetti and have since designed/created/directed puppet shows, designed/built puppets for other plays, and taught various workshops and a college course. 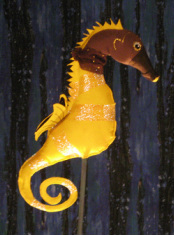 I LOVE puppets and want to spread the word about this fantastical theatre art! Charles Thomson, Secretary of the Continental Congress, 1776! 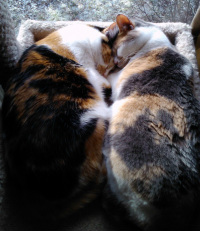 "Oysters" under construction for "Alice in Wonderland"
Kitty (on left) has grown up!